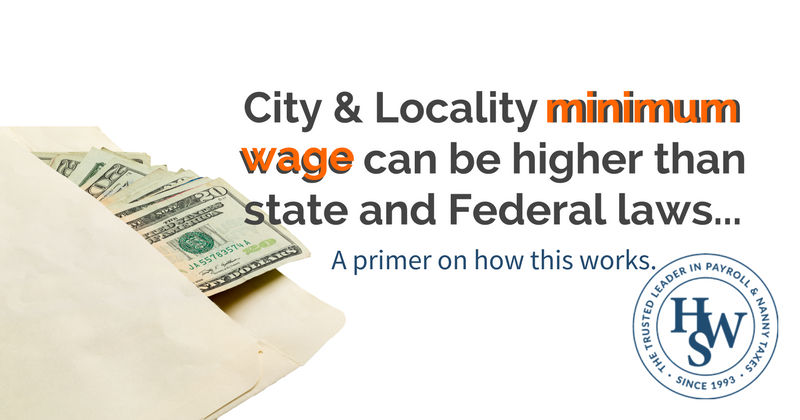 Did you know some cities have minimum wages higher than state and Federal laws? Home / Our Blog / Did you know some cities have minimum wages higher than state and Federal laws? Minimum wage and overtime laws are contained in a complex assortment of Federal, state and local laws and ordinances. Under FEDERAL law, nannies, maids, housekeepers and senior caregivers are all HOURLY employees. This means, in short, that minimum wage and overtime laws apply to them nationwide. Household or domestic workers - again nannies, maids, housekeepers and senior caregivers - often have minimum wage and overtime law exceptions and carve outs created by Federal, state and local laws, as well as Domestic Worker Bill of Rights laws that are different from other classes of hourly workers. The laws most beneficial to the worker are always the ones in force. So if you are in a state with a minimum wage higher than the Federal minimum wage, you must adhere to the state law. If you are in a state with daily overtime for example, or overtime applying to live-in domestic workers, you must adhere to those laws also. Some state and many local minimum wage laws are tiered, and have different applicability depending on the total number of employees, as well as whether the employer is a government contractor. Lastly, some states exempt workers paid by state Medicaid or similar programs from the higher minimum wage and overtime laws that apply to other employers. It's complicated, right? One of the best online resources to quickly see the status of minimum wage and overtime laws where you live is the University of California, Berkeley's Labor Law Center. These laws are fluid, and many are stayed by court orders or have been overturned by the courts. While this is a good first look resource, all information should be confirmed directly with the appropriate state or local agency tasked with labor law enforcement. HomeWork Solutions maintains a list of state minimum wages for household employment that distills state laws as they apply to Household or Domestic employers. Our individual tip sheets for nanny tax rules by state help household employers understand other state labor laws, including overtime, and how they apply to their situations. Complete the form below and one of our payroll experts will reach out to you ASAP. You may also call 1-877-899-3004 to speak with our team immediately.